Anyone play a Yamaha Absolute Hybrid Maple drum set? Anyone play a Yamaha Absolute Hybrid Maple drum set? I am just wondering what your thoughts are on the drums? Do you also play other Yamaha kits? If so, how do they compare? How is the bass drum? Thank you, in advance. I haven't owned one but have -played one, very nice, I compared them head to head with the Live Customs...pretty darn close to me. So I snagged a "B" stock kit from DCP. At the regular price Live Customs were way less money, "B" stock saved a little more. I like Yamaha a lot, but sadly they have discontinued the Live, and now dont seem to have a kit in that price range. So when played by me and another at DCP...I found the kicks very similar, same with the toms, both had that nice Yamaha feel. And I have currently 2 Recording Custom kits and have owned Maple custom and birch absolute......all great drums. I am a big fan. They have a huge range. They were used in two clinics in my shop. One was for Mark Kelso, who tunes drums very high with his percussive style and they sang. The other clinic was Larnell Lewis and he had a nice medium to low tuning and the drums rocked. I personally love to find the lowest a drum can go without conking out and these ones handle low great. The bass drum has a great punch , especially with a Powerstroke 3 type of head. The snare is totally underrated as well. I think these are as good as the old MIJ Maple Customs. My local drum shop’s owner told me today he put an order for his first new drum set in many years. It was the Hybrid Maple kit. This guy has access to everything yet he put his money on this kit. They’re that good. Peaked my interest. I’m sure he got them for a great price. Picked up a 4pc Yamaha AHM gently used from Allan @ Rufus Drums in Vancouver BC in late 2017. Love the sound and projection of this kit and the bass drum is killer. Construction quality is really great as well. Kind of funny timing wise on your question Treviso as I was comparing the used kits I have side by side : Yamaha RC MIJ and a recently acquired Oak Custom MIJ against the AHM on which sound overall is the best -can’t decide as they are each so unique in their own right (IMHO). I'm plenty intrigued by them too. I have a set of Live Customs that I really like and don't really need two modern sounding Yamaha kits, but the eye wanders sometimes.... I'd love to try some out. 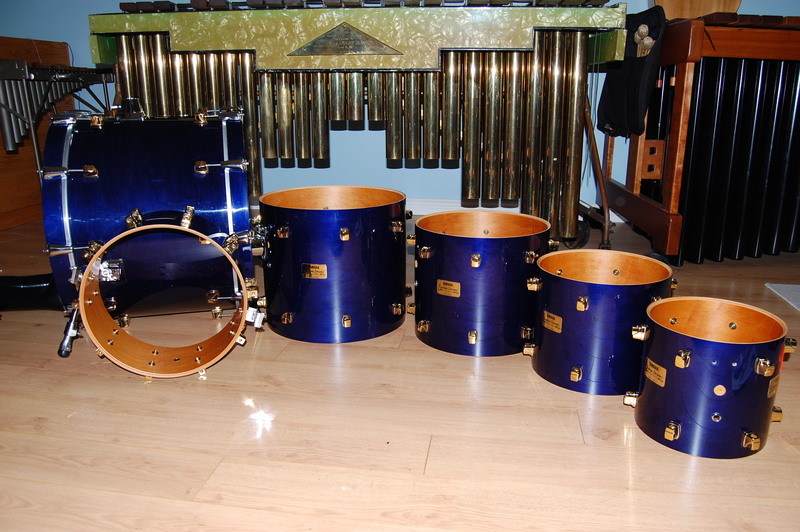 I see reasonable deals on used AHM kits from time to time too, especially for the smaller # of drums configuration I'd be looking for (22x14, 12, 16). I really love the finish on your new kit...that's my favorite currently being offered...I believe it's called gold champaign sparkle? That one does it for me! Thank you for taking the time to post. How is the bass drum? That is always the drum that makes up my mind on any kit. If the bass drum doesn't thump with some OOMPH...I don't want it! Wonder how they compare to Tama Starclassic maples. I have both the AHM and the new RC's, and for sure the AHM have more projection. With 2 ply heads they can do very well from low to med-high tension, and if you want something that sings a little clearer I recently put UV1s on and I think this is it for me, that is my ideal drum. My go-to snare is the AHM I bought used afterwards in a different finish, with a brass snare close by just in case. Do you have any pictures of your drums that you can share? Me too. I've owned Pearl, DW, and Tama maples. The Starclassics are my favorite, but I have not played the Absolute Hybrid. With pleasure (ipad morning pictures, be gentle) ! I started working on both side to side last week to see which one I was going to use for a recording. I am a 1up / 1-or-2down player at heart, but the guy I am working with at the moment loves high pitched tom fills so I am trying to adjust. Seems to me offset toms might be my best option. That ahm bass drum needs to be tamed, it really puts my dynamic control to the test. I get a little too excited and it has the capacity overpower everything else. I would compare RC To a 2l 4 cylinder turbocompressed engine : all I will ever really need, and it will max out at some point and stay there which is not a bad thing. Tthe ahm is a german V8 4.0 twin turbo monster : step on the pedal, and I'll choke before it ever will. That is a great way to put it !! It also probably just led to 10-15 new AHM sets being sold throughout the world. The ahm was a floor model with a great discount so I did not choose custom finish or sizes. The only change I would make would be a 20x16 bd instead of 22x18. Then again, muffling can go a long way. The 14 floor tom is not necessary as I use a deeper metal snare with a hydraulic head with this kit. These drums have'nt seemed to of caught on that much like legacy Yamaha models...... I think because there are no finishes that are to die for. What Yamaha SHOULD do.. is make at least a couple just like the older models so people will really get their mouths watering. The Blue and Turquoise with Gold lugs.. and maybe the Fire Red they had. Offer the Gold Lugs as an option as they just make some finishes POP in a HUGE WAY IMO. And then there was the CUSTOM SERIES. .. Yamaha could do this again. .. I have owned many, many Yamaha drums over the years. A couple years ago I went to the Yamaha showroom to compare the new Recording Custom, the Absolute Hybrid Maple, the Live Custom and the Phoenix. I brought my Gretsch 12" tom for comparison. The AHM are very nice, especially the snare drum. They all have a clean, "processed" sound about them. I personally do not like those quick release lugs though. The Live Custom were more aggressive sounding, maybe a bit more high frequencies. The Phoenix were fat, with a bit more low mid range frequencies. Again, the quick release lugs are a deal breaker. The new Recording Customs were what I went with. Very nice tone, which was very similar to my Gretsch, but the sustain cuts off quickly after a gradual taper. The bass drum is super fat (and nothing like the old Recording Custom bass drums).